Pavement materials play an important role in overall pavement sustainability including material acquisition processing, and transportation. The main objective of the present study is to evaluate the effectiveness of new additives, to reduce bitumen’s fume emission expelled into the atmosphere, during the processing of asphalt concrete. The new additives act by trapping bitumen’s volatile substances avoiding their release at high temperatures. 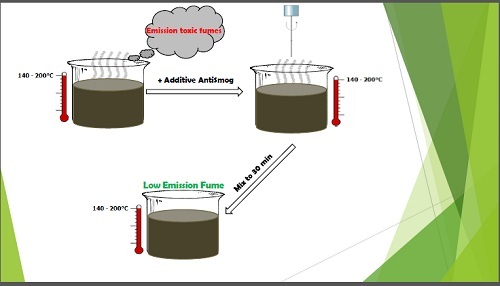 In this paper, we have been tested the performance of 2 types of mesoporous silica-based additives (AntiSmog 1 and AntiSmog 2). The idea of using these additives to reduce the emission of fumes in bitumen has been submitted as a patent. To quantify and characterize the emitted fumes, thermogravimetry (TGA) and gas chromatography-mass spectrometry (GC-MS) technique have been used. Dynamic Shear Rheology (DSR) has been used to check the rheological properties and the possible sedimentation issues that could occur after the addition of the additives. - M.W. Bardeesi, Y. Attallah, Economic and environmental considerations for pavement management systems, European Scientific Journal, 2015, 11, No.29. - K.J. Kowalski, J. Król, P. Radziszewski, R. Casado, V. Blanco, D. Pérez, V.M. Viñas, Y. Brijsse, M. Frosch, D.M. Le, M. Wayman, Eco-friendly materials for a new concept of asphalt pavement, Transportation Research Procedia, 2016, 14, 3582-3591. - B. Peng, C. Cai, G. Yin, W. Li, Y. Zhan, Evaluation system for CO2 emission of hot asphalt mixture, Journal of Traffic and Transportation Engineering (English edition), 2015, 2 (2), 116 - 124. - 4. P.Q Cui, S.P. Wu, Y. Xiao, M. Wan, P.D. Cui. Inhibiting Effect of Layered Double Hydroxides on the Emissions of Volatile Organic Compounds from Bituminous Materials, Journal of Cleaner Production, 2015, 108, 987-991. - P.Q. Cui, S.P. Wu, Y. Xiao, H.H. Zhang. Study on the deteriorations of bituminous binder resulted from volatile organic compounds emissions, Construction and Building Materials, 2014, 68, 644-649. - C. Oliviero Rossi, P. Caputo, G. De Luca, L. Maiuolo, S. Eskandarsefat, C. Sangiorgi, 1H-NMR Spectroscopy: A Possible Approach to Advanced Bitumen Characterization for Industrial and Paving Applications, Applied Science, 2018, 8, 229. - L. Gate, C. Langlais, J.C. Micillino, H. Nunge, M.C. Bottin, R. Wrobel, S. Binet, Bitumen fume-induced gene expression profile in rat lung, Toxicology and Applied Pharmacology, 2006, 215, 83–92. - Fall 12-17-2010 Effects of Warm-mix Asphalt Additives on Asphalt Mixture Characteristics and Pavement Performance Jun Zhang University of Nebraska-Lincoln, junzhangnj126@huskers.unl.edu. - Y. Xiao, M. Wan, K.J. Jenkins, S.P. Wu, P.Q. Cui. Using Activated Carbon to Reduce the Volatile Organic Compounds from Bituminous Materials, Journal of Materials in Civil Engineering, 2017, 29(10), P: 04017166. - P.Q Cui, H.G. Zhou, C. Li, S.P. Wu, Y. Xiao. Characteristics of Using Layered Double Hydroxides to Reduce the VOCs from Bituminous Materials, Construction and Building Materials, 2016, 123, 69-77. - M. Posniak, Polycyclic Aromatic Hydrocarbons in the Occupational Environment during Exposure to Bitumen Fumes, Polish Journal of Environmental Studies, 2005, 14(6), 809-815. - M. Hasanzadeh, N. Shadjou, M. de la Guardia, M. Eskandani, P. Sheikhzadeh, Mesoporous silica-based materials for use in biosensors, Trends in Analytical Chemistry, 2012, 33, 117-129. - R. Narayan, U.Y. Nayak, A.M. Raichur, S. Garg, Mesoporous silica nanoparticles: A comprehensive review on the synthesis and recent advances, Pharmaceutics, 2018, 10, 118; doi:10.3390. - M. Manzano, M. Vallet-Regí, Mesoporous silica nanoparticles in nanomedicine applications, Journal of Materials Science: Materials in Medicine, 2018, 29(5), 65. - Y. Song, Y. Li, Q. Xu, Z. Liu, Mesoporous silica nanoparticles for stimuli-responsive controlled drug delivery: Advances, challenges, and outlook, International Journal of Nanomedicine, 2017, 12, 87-110. - P.N. Diagboya, E.D. Dikio, Silica-based mesoporous materials; emerging designer adsorbents for aqueous pollutants removal and water treatment, Microporous and Mesoporous Materials, 2018, 266, 252-267. - P. Cheyssac, M. Klotz, E. Søndergård, Optical properties of ordered mesoporous layers of silica, Thin Solid Films, 2006,495(1-2), 237-242. - J. Miguel, J. Mateos, L.C. Quintero, C. Rial, Characterization of petroleum bitumens and their fractions by thermogravimetric analysis and differential scanning calorimetry, Fuel, 1996, 75(15), 1691-1700. - G. Boczkaj, A. Przyjazny, M. Kamin, Characteristics of volatile organic compounds emission profiles from hot road bitumens, Chemosphere, 2014, 107, 23–30. - L.T. Gibson, Mesosilica Materials and Organic Pollutant Adsorption: Part A Removal from Air, Chemical Society Reviews, 2014, 43, 5163-5172. - H. A. Barnes, J. F. Hutton, Walters, K. An introduction to rheology, Elsevier Science, 1989, 198. - C. Oliviero Rossi, P. Caputo, V. Loise, D. Miriello, B. Teltayev, R. Angelico, Role of a food grade additive in the high temperature performance of modified bitumens, Colloids and Surfaces A: Physicochem. Eng. Aspects, 2017, 592, 618–624. - E.I. Szerb, I. Nicotera, B. Teltayev, R. Vaiana, C. Oliviero Rossi, Highly stable surfactant-crumb rubber-modified bitumen: NMR and rheological investigation, Road Materials and Pavement Design, 2017, 19(5), 1192-1202. - S.S. Idris, N.A. Rahman, K. Ismail, A.B. Alias, Z.A. Rashid, M.J. Aris, Investigation on thermochemical behaviour of low rank Malaysian coal, oil palm biomass and their blends during pyrolysis via thermogravimetric analysis (TGA), Bioresource Technology, 2010, 101, 4584–4592. - R.E. Zacharia, S.L. Simon, Dynamic and Isothermal Thermogravimetric Analysis of a Polycyanurate Thermosetting System, Polymer engineering and science, 1998, 38(4), 566-572. - Determination by Solid-phase Micro-extraction/Gas Chromatography/Mass Spectrometry of Polycyclic Aromatic Hydrocarbons in Bitumen Fumes During Road Pavingy, J. Mass Spectrom, 1999, 34, 1383–1384. - A. Bouaid, L. Ramos, M.J. Gonzalez, P. Fernàndez, C. Càmara, Solid-phase microextraction method for the determination of atrazine and four organophosphorus pesticides in soil samples by gas chromatography, Journal of Chromatography A, 2001, 939, 13-21. - N. Baldino, D. Gabriele, C. Oliviero Rossi, L. Seta, F.R. Lupi, P. Caputo, Low temperature rheology of polyphosphoric acid (PPA) added bitumen, Construction and Building Materials, 2012, 36, 592-596. - N. Baldino, D. Gabriele, F.R. Lupi, C. Oliviero Rossi, P. Caputo, T. Falvo, Rheological effects on bitumen of polyphosphoric acid (PPA) addition, Construction and Building Materials, 2013, 40, 397-404. - G. Polacco, S. Berlincioni, D. Biondi, J. Stastna, L. Zanzotto, Asphalt modification with different polyethylene-based polymers, European Polymer Journal, 2005, 41, 2831-2844. - C. Oliviero Rossi, A. Spadafora, B. Teltayev, G. Izmailova, Y. Amerbayev, V. Bortolotti, Polymer modified bitumen: Rheological properties and structural characterization, Colloids and Surfaces. A, Physicochemical and Engineering aspects, 2015, 480, 390-397. - F.J. Navarro, P. Partal, F.J. X Martınez-Boza, C. Gallegos, Inﬂuence of processing conditions on the rheological behavior of crumb tire rubber-modiﬁed Bitumen, Journal of Applied Polymer Science, 2007, 104, 1683-1691.